TECHknitting: Mysteries of knitting part 1 - A tale of heads and arms, or: "why does stockinette curl but ribbing doesn't?" Mysteries of knitting part 1 - A tale of heads and arms, or: "why does stockinette curl but ribbing doesn't?" Do you wonder why stockinette fabric curls and ribbing doesn't (and garter doesn't, and seed stitch doesn't)? Does it puzzle you why stockinette sometimes curls from side-to-side, and sometimes from end-to-end? Does it confuse you that garter stitch and reverse stockinette look so alike? Is it mysterious to you that "nothing but knit" makes stockinette if worked in the round, but makes garter stitch if worked flat? These questions may seem random and unrelated, but they're not--the same explanation answers all. Knitting, as you know, consists of loops drawn through other loops. Now, a loop is a fluid little creature. It's hard to say where one loop begins and the next one ends (which is one reason that knitting is so nice and stretchy). But once we pin this down, once we name the parts, knitting gets a lot less mysterious. When we "knit," we draw the new loop through the old so as to HIDE THE HEAD and EXPOSE THE ARMS of the old stitch. In more technical terms, we are aligning all the heads on the back face of the fabric, and all the arms on the front face of the fabric. Do it. Knit one stitch. Peer over the edge of your needle--see how you're popping the head of the old stitch to the BACK of the fabric? Look again at the side on which you are working--see how you're lining up the little arms in V's on the FRONT of the fabric? See how ALL the heads with their nubby little bumpy heads are lined up on the BACK of the fabric? See how ALL the arms with their pretty little V's are lined up on the FRONT of the fabric? See how I can't get off the SHIFT key? That's because all these things are IMPORTANT, people! 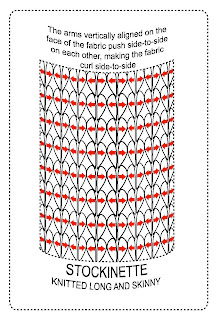 The result: Due to the way the knit stitch aligns the head and arms, stockinette fabric features all the arms on the "front" of the fabric, where they lay nice and smooth, while all the bumpy heads were popped to the back, where they lie mostly hidden on the other side of the fabric. Now knit to the end of your row, watching the head-popping, arm-aligning miracle of each knit stitch and ... get ready to purl. Oooh. The excitement! Purl three stitches (again, just to get away from the edge) and now watch what happens as you purl the fourth stitch. When we "purl," we do the exact opposite of knitting. This time we draw the new loop through so as to HIDE THE ARMS and EXPOSE THE HEAD of the old stitch. In more technical terms: just like with the knit stitch, we are again aligning all the heads on the one face of the fabric, and all the arms on the other face of the fabric. However, purl pops the head TOWARDS you, while knit pops it AWAY from you. Because you've turned the fabric around between your knit row and your purl row, purling the head TOWARDS you on the fabric back and knitting it AWAY from you on the fabric front creates that alignment I've been yammering about. The result: All the heads are on the "front" of this reverse stockinette fabric, where they lay nice and nubbly, while all the smooth arms lie hidden on the back of the fabric. Purl to the end of the row, and let's look at the front of that little swatch one more time together. See all the little V's of the arms on the front of the fabric? Those little V's, being 2 pieces of vertical yarn laying side-by-side, are WIDER than the head, which is only 1 little piece of horizontal yarn. (OK, there's also the tail which we are ignoring for right now-but that's horizontal too.) In addition, all those vertically aligned arms laying side by side are jostling for position--they're pushing on each other side-to-side, repelling one another like incompatible magnets. The result is a fabric which is actually WIDER on the front than the back! Because the front is wider, stockinette curls from side to side with the knit face out. And this is also why you can't block the curl out of a stockinette scarf --the curl is built right into the structure of the fabric. But wait a minute--the little scrap on your needles--yes, it is curling from side to side a little bit, but what it's really doing is trying to curl top-to-bottom into a horizontal tube--what's with that? Well, part of the answer is that your needle is pinning the fabric, stopping it from expressing its side-to-side roll. But the real truth is even stranger. You see, just as stockinette fabric is wider on the front than the back, it is LONGER on the back than the front. The heads (and tails!) draw a great deal of horizontally aligned yarn onto the back, so there's more horizontal yarn on the back than the front. All those horizontal heads are jostling for space back there--they are pushing each other away, repelling one another, making the fabric curl over end-to-end (top-to-bottom). If this is still confusing, here's one more run at it: If you put all the arms on ONE side of the fabric, then all the heads (and tails!) 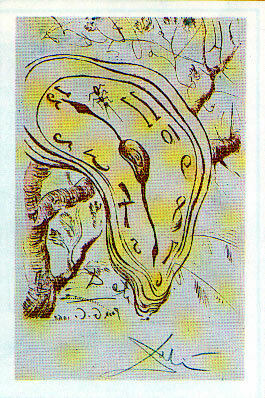 on the OTHER side, you get something surreal--something out of one of those melty Dali paintings--a fabric that's actually WIDER on the front than the back, and LONGER on the back than the front. In a long skinny piece of stockinette (a scarf) the side-to-side curl of the wider front fabric will predominate, in a short wide piece of stockinette (your 6 row swatch, a cast-off edge at a neckline or hat brim) the top-to-bottom curl of the longer back fabric will predominate. 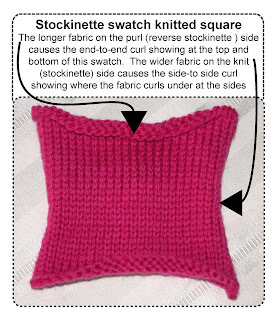 In a square, stockinette will curl on all 4 sides--from side-to-side AND from end-to-end. Here--I've done a bigger swatch for you so you can see without having to knit it yourself. 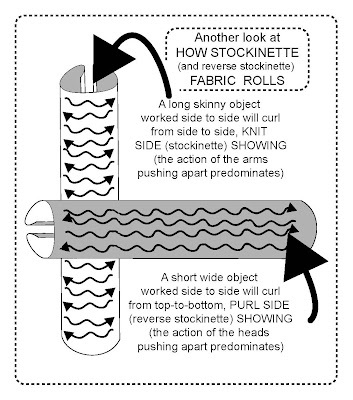 So--now that we've been splashing around in the concepts of head alignment and arm alignment, we're finally ready to answer the question about why stockinette curls, and ribbing doesn't. Stockinette, as we've said, curls from side-to-side because it is wider on the front than the back, and curls from top-to-bottom because it is longer on the back than the front. Which kind of curl predominates depends on whether the fabric is short and wide, or long and skinny. However, ribbing, garter, seed stitch don't curl at all--not top-to-bottom, not side-to-side. And this is because there is a roughly equal number of heads and arms on EACH face of the fabric. Knit a couple of rows in a few of these stitches and you'll see for yourself that it doesn't even matter how the heads and arms are arranged, whether in alternating rows (garter stitch), alternating columns (ribbing) or some other pattern (seed stitch) (flat-knitted seed stitch, a.k.a. moss stitch=k1, p1 every row on an odd number of stitches). All that matters for non-curling is that there be a roughly equal number of heads and arms on each side of the fabric. Once the numbers are equal, the fabric reverts to something more normal: it isn't wider on one side and longer on the other. 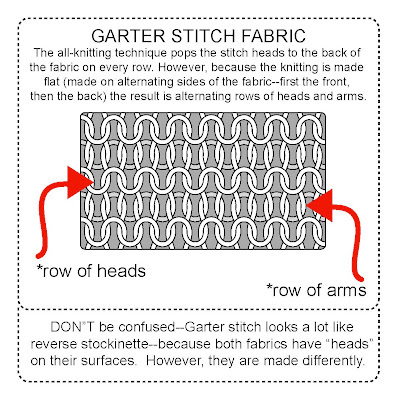 Because they have an equal number of heads and arms on both sides, garter fabric, ribbing, seed stitch and other similar fabrics are equally wide on each side, and equally long on each side, so there's no curl. Long story short: Same number of arms and heads on each side of the fabric=no curl. That's all there is to it. Why garter stitch and reverse stockinette look so alike. Garter stitch is made by knitting every row back and forth. Now, as you know from the first little experiment, knitting pops the heads of the stitches out on the back of the fabric--away from you. If you make garter stitch by knitting back and forth--first one one side of the fabric, and then on the other--you're popping the heads out on ALTERNATE sides of the fabric, and the result is one row of heads is alternated by one row of arms. 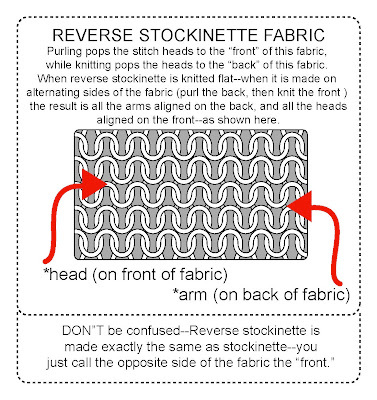 In other words, in garter stitch, you're not aligning all the heads on one side and all the arms on the other, as you do in stockinette--instead, as stated above, under the explanation of curling, you're aligning them in equal rows on both sides of the fabric. As to why garter stitch looks a lot like reverse stockinette, it's because heads are a lot more assertive than arms. Stated otherwise: knitted arms lie in meek, flat, unassuming little V's. Heads stick up--they are bolder, more three dimensional. Garter stitch puts heads on both sides of the fabric. True, garter stitch also puts arms on both sides of the fabric, as you can see from the drawing above, BUT like assertive types everywhere, the 3-D heads predominate --they capture the eye, while the meek, flat arms retreat from notice. 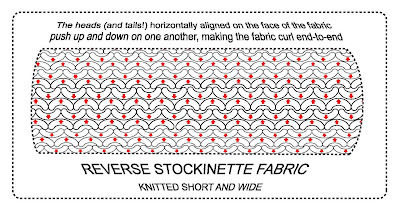 In reverse stockinette ALL the heads are on the face of the fabric, in garter stitch, only HALF the heads are on each face of the fabric. But because of the presence of those assertive heads in both garter stitch and reverse stockinette, both fabrics look alike, although they are made differently. To distinguish garter stitch from reverse stockinette, just flip the fabric over and you'll never be mistaken. Garter stitch looks the same on both sides, while reverse stockinette features smooth stockinette fabric (the arms) on the other side. Now we're at the final question. All the stuff above about head and arm alignment makes it possible to explain why "nothing but knit," done in the round, turns into stockinette, while done back-and-forth it turns into garter stitch. You won't be surprised to hear that the answer, again, lies in the alignment of the heads and the arms. If you knit there and purl back, you already know that you're aligning the all the heads on one surface of the fabric, and all the tails on the other surface of the fabric. 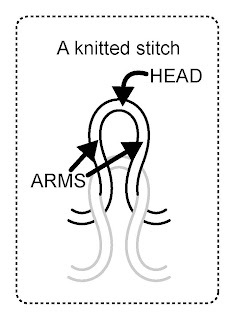 In other words, knit stitch (done on the front of the fabric) pops the heads back and purl stitch (done on the back of the fabric) pops the heads forward, so all the heads always end up on the same side--the back. In circular knitting, you never work on the back of the fabric--you're always going around and around on the FRONT of a fabric TUBE. In other words, you never "turn at the end of the row" because there IS no "end of the row." There is only a never-ending spiral tube. 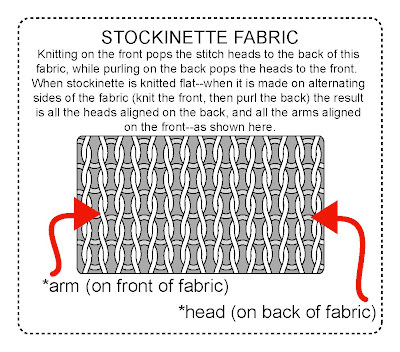 So, in order to make stockinette fabric--in order to align all the heads on the back and the arms on the front, all you have to do is knit. One more time: knit stitch pops the heads to the back. So, if you stay on the knit side--the front side of the fabric--all the heads will only be where you popped them: on the back of the fabric, the inside of the tube (reverse stockinette).